Learn from Ronnie Nijmeh as he teaches you many different ways to use private label rights (PLR), as well as how to repurpose it to make even more products and money. If you prefer, you can head on over to Itunes Podcasts to download the free MP3, and listen on the go. 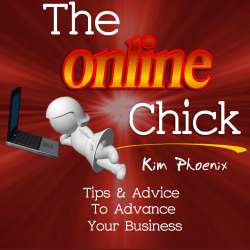 Just do a search for “The Online Chick – Kim Phoenix,” and you’ll find it! You can also download the printed transcript and summary checklist here. Note: This was my very first podcast. You will notice that there is a very echoed introduction, so I apologize for that. I think it was my microphone. Ronnie does the majority of the talking in this podcast, and fortunately, his voice does not echo. I thought the information though was too valuable for me not to share it with you, despite having had this problem. I hope you can put his tips to good use!